TAIVER HTP 44000-380VOLT is the newest pump from the wide TAIVER range. It has been designed for spraying all kind of thyxothropic products in Building, Water-proofing application, Anti-fire products, industrial carpentry, etc. 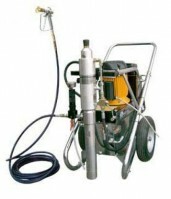 It is ideal for plaster-applicators who want to have a new technology for plaster applications or stucco works on walls. With HTP 44000 is also easy to spray with two or more spray guns at the maximum performance.The airless system: The Airless system allows a faster atomization and reduces the over spray, therefore a paint and solvent saving. Less over spray means also less pollution with benefits for the worker’s health. Construction specifications: The electric motor is H class, that means: maximum quality and safety. It can work in very bad conditions and with very high temperature. An automatic system stops the pump when exceeding the electric safety limits.All parts in contact with the product are in stainless steel in order to grand the highest performance. HTP 44000 has been designed for an easy maintenance. Performances: Ideal for big jobs!! Slower and longer cycles to improve the life of the pump Hydraulic system at very high volume in order to grant a perfect perfomance even in hard work’s conditions. The cylinder and the relief valve have a manual start as to offer an easy and fast maintenance Piston and cylinder are in hard chrome for a long life. New system of self-adjusting packings which avoid the premature wear due to continuous manual adjustings.